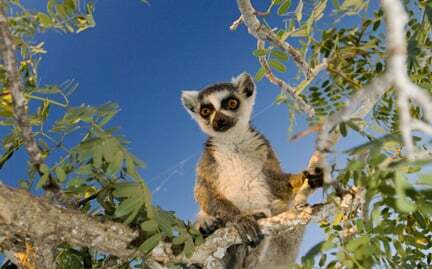 Found only in the southern and southwestern forests of Madagascar, ring-tailed lemurs’ diet consists mainly of fruit, but also leaves, seeds and the occasional insect. Unlike most lemurs, which are usually found in trees, the ring-tailed lemur spends time on the ground. They form troops of up to 25 individuals and use 15 different sounds to keep the group together during foraging and to send alarms when predators are near.